Thanks for stopping by! Make sure to subscribe or join us on facebook to get our newest posts. 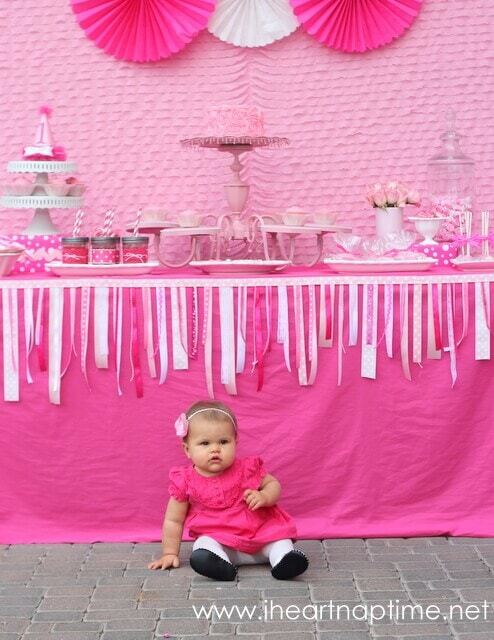 My daughter Emmalyn is just about as girly as they come and she LOVES pink. She enjoys trying on my pearls and her bows, so I wanted to tie that into the theme as well. I love to create decor on a budget so I found a lot of the decor pieces from Goodwill and upcycled them with pink spray paint. My favorite upcycle was an old rusty chandelier I found for $5. 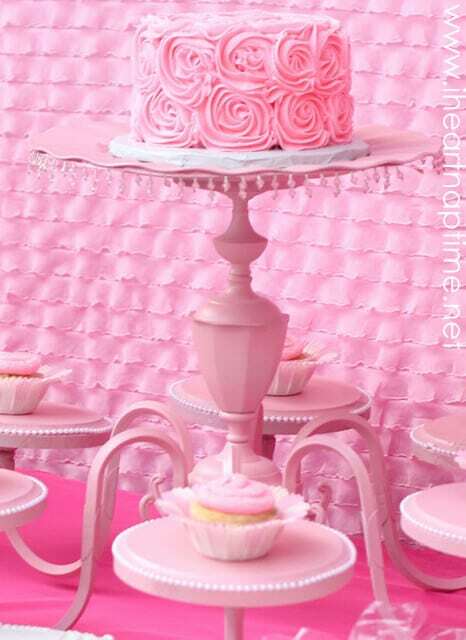 I turned it into a beautiful pink cake stand trimmed with pearls. It completed the whole dessert table! You can find the tutorial here. 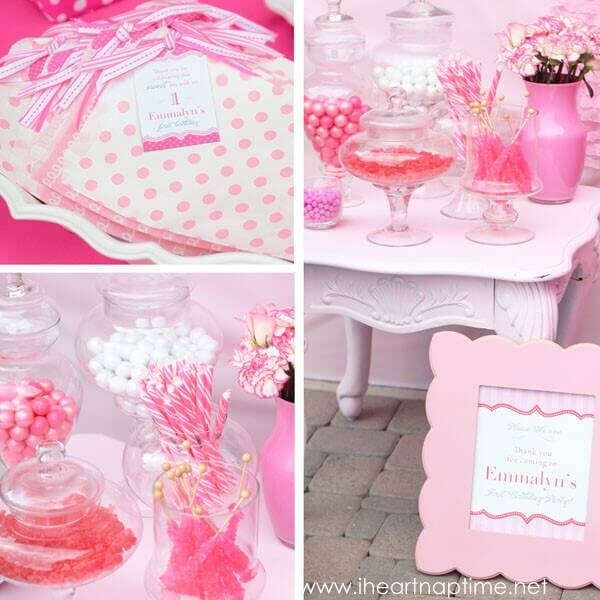 I also turned an old nightstand I found for $2 into a ‘Pretty in Pink’ candy station. I converted some dollar store glass vases by pouring pink paint inside and swirling it around. 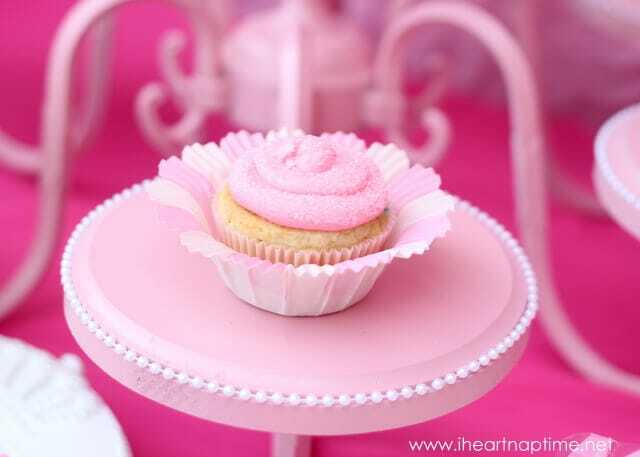 Then I filled them with fresh pink flowers to add to the dessert table. You can find both of those tutorials here. 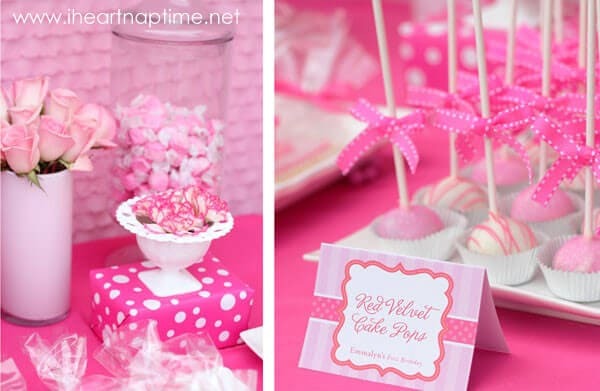 I created polka dot favor bags with ribbon and a thank you tag that they could fill with candy. At the candy station we had pink gumballs, sixlets, rock candy, gummy bears, suckers and bubble gum sticks. I also spray painted a bunch of cute funky frames with pink spray paint to display Emmalyn’s photos from her first Birthdays shoot. 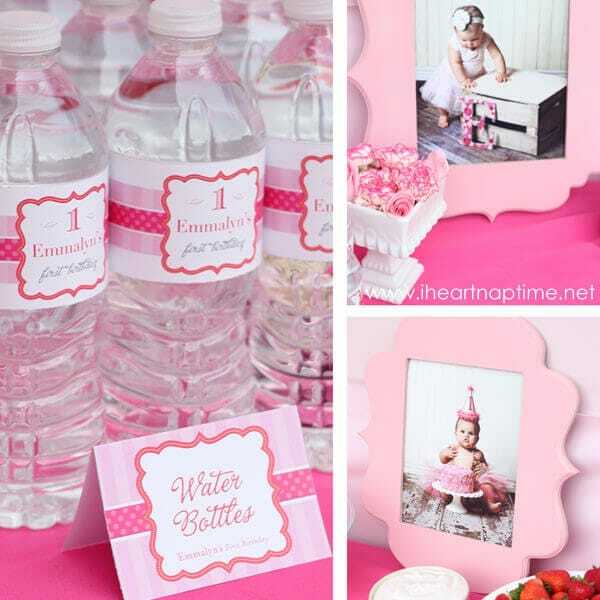 For the party we served pink lemonade, club wraps, chicken croissant sandwiches, chips, veggies, fruit and strawberry dip. 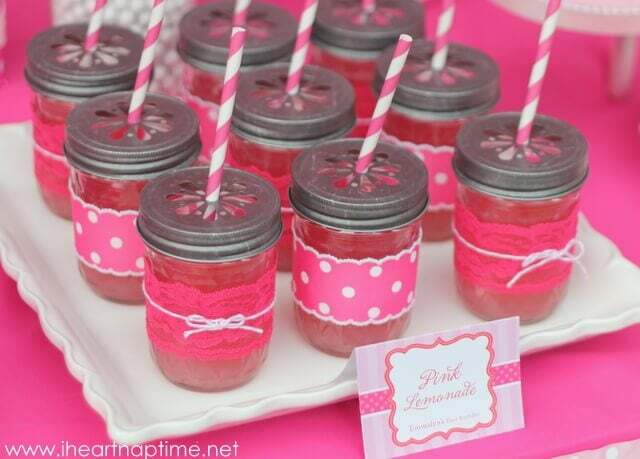 I poured the pink lemonade in mason jars topped with citrus flower lids and pink striped straws. I wrapped each jar with ribbon, lace and twine securing it with glue dots. See the mason jar cups tutorial here. The dessert bar was the best part! For the backdrop I hung up ruffle fabric with mounting tape and hung pommette’s in the center. 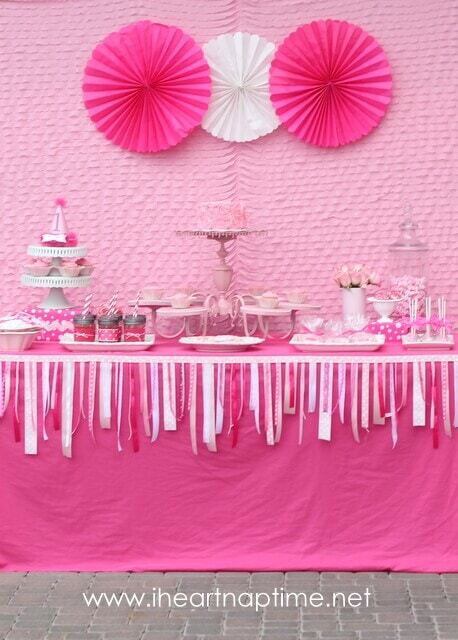 I draped the tables with pink fabric and hung the ribbon banner across the front. We had vanilla cake with strawberry filling, red velvet cake pops, royal icing cookies and strawberry cupcakes. For the party we rented a princess bounce house and the kids had a ball jumping while the parents chatted and ate lots of cookies! The kids also had fun tossing balloons and blowing bubbles. Of course the best entertainment of all was watching our sweet girl dig into her first Birthday cake. We all snapped pictures with the Birthday queen and she just kept eating away. 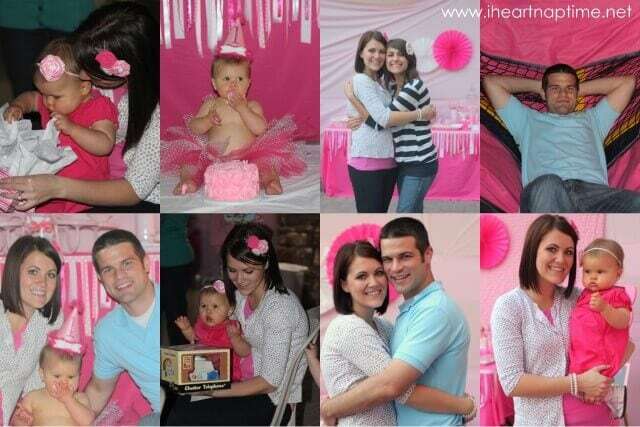 We love our sweet Emmalyn and I loved all the details that went into planning her first Birthday. It will definitely be a party to remember. 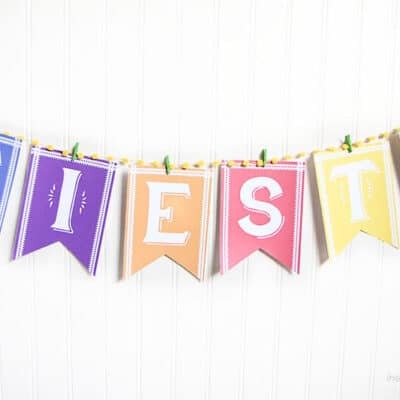 I was thrilled to have this party featured on Hostess with the Mostess!! You can see the feature here. I couldn’t have done this party with out the support from my wonderful family and fabulous vendors. THANK YOU!! 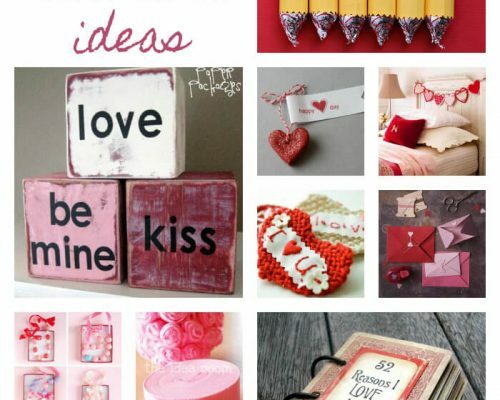 Check out our project gallery for more DIY projects! Who I Am... and a NEW blog series! 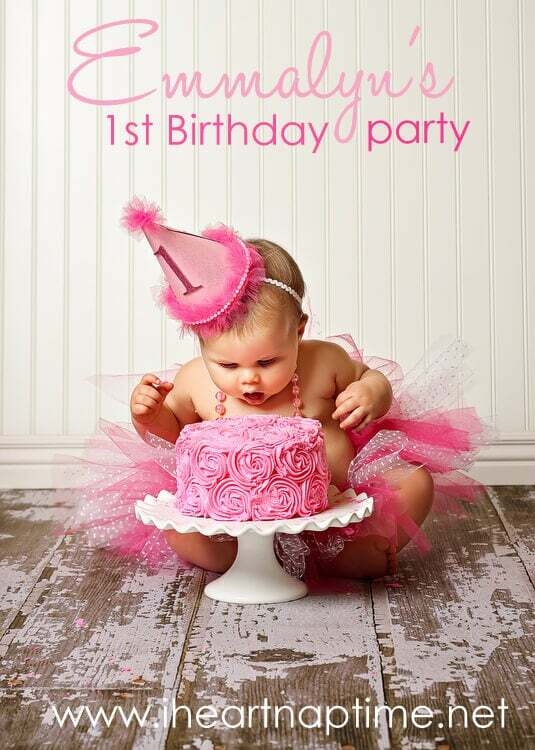 Hi – I just happened upon this while planning my daughter’s 1st birthday and I ADORE what you’ve done. Can you tell me how you mad the ribbon banner hanging along the front of the table?! 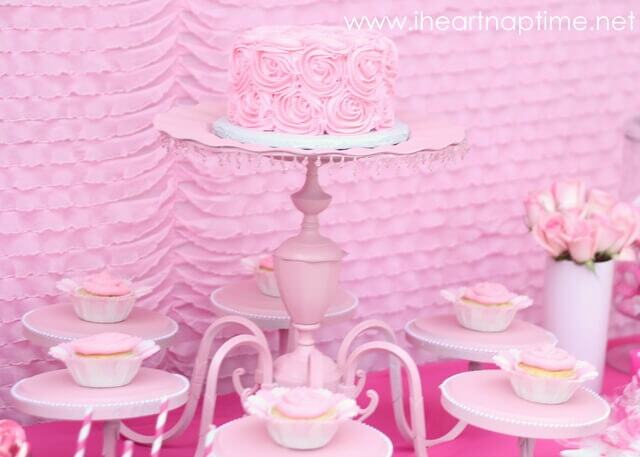 I was so inspired and excited after seeing your daughters first bday photos..I got so many new ideas for my daughters first bday which was on Dec 27th 2014.The theme was pink n white.Starting from the tutu skirt(pink n white),pre bday photos(with a pink cake in front) ,flower making(pink n white) i did everything myself and guess what?I enjoyed planning and doing every bit of it.There were around 100 guests and everybody just loved it. Just stumbled upon this post and I couldnt help but stop and look! 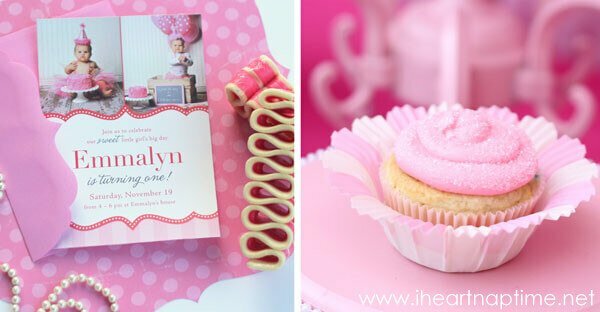 We are doing a tutu/ballerina 1st bday theme for my daughters upcoming bday…but the most hilarious part is her name is Emilyn…so close to Emmalyn! Too funny! ABSOLUTELY BEAUTIFUL!!! How much did this cost in total? How many guests did you have? You are fabulous! i just found your site from pinterest! I am curious though, what have you done with all the decorations? I am helping a family friend plan her daughter’s first birthday party in April and what you have done here is exactly what I imagined! Thank you Nathalia! I recently moved to Ohio, so I have kept, sold, and repainted a lot of the decorations! 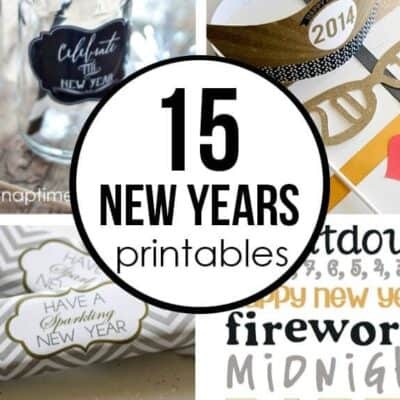 I have a list at the bottom of the post for all the vendors…there are a lot of the printable things you can buy exactly like mine! :) Hope her party turns out well! Adorable! 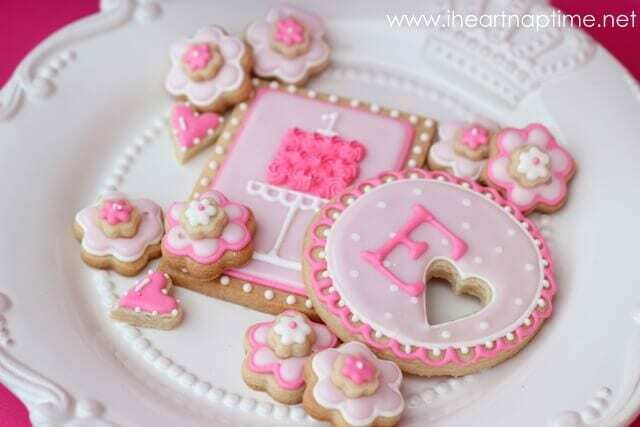 I love the cookie with the little heart cut out. 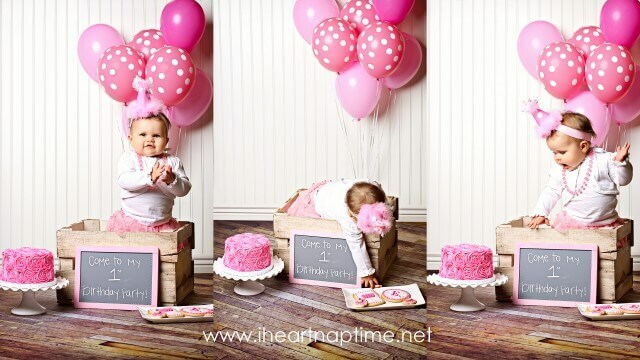 Might have to steal the idea for my little munchkins 1st birthday! Thanks for sharing this! 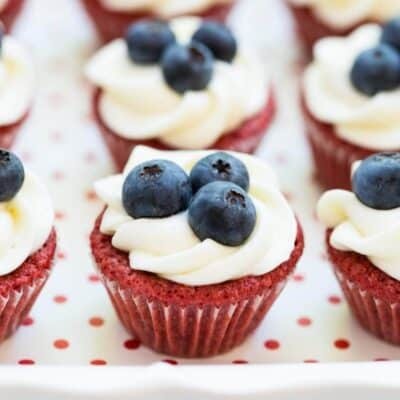 Hi, love this party! 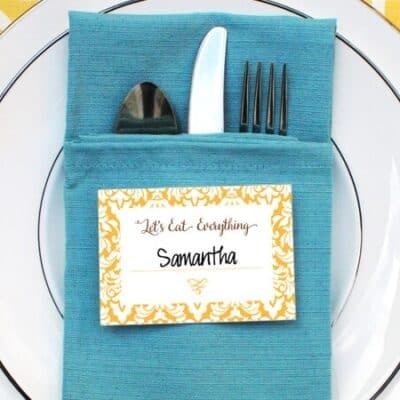 I was wondering where you sourced the hot pink envelopes for the invitations…I love the scalloped edge! Thank you! Hi Vicki! I picked those up at a local store here called Scrapbooks Etc. You may want to check http://www.envelopemall.com/ …they may have something similar. I actually saw the picture of your daughter with the cake at the hospital where my son was in the NICU. But I noticed that all your credits are for vendors in AZ, I saw the picture in a hospital in TX.